With the Ten of Wands, we have reached the end of a cycle after a period of struggle; and finally we can get rewards after investing a lot of hard work and effort. The very creative path got to the end and completion, with greater responsibilities and commitments. We have to ensure a successful future. Ten is the Tarot number of abundance, Wands are the Tarot symbol of creative energy and this card illustrates a person with too many of these creative aspirations on a slow road home. 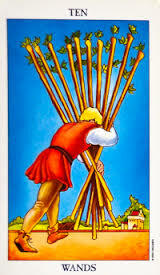 When the Ten of Wands appears – you may feel as though you are carrying a very heavy burden. You may want to look if there is a way to lighten your burden. Or to delegate some shores. It will be important for you to pace yourself now. Don’t try to do too much and take a break; you have been working very hard. Your workload may be unrealistically heavy now. Don’t hesitate to ask for help. If you are looking for a position without much success, do not lose faith, keep charging. Don’t deny the issues with your partner, there is something in the relationship which needs to be examined, looked at, and considered, have an open heart dialogue with your partner. If you are looking for love, do not despair. Your time will eventually come, but perhaps now is a good time to halt your search and just take some time for rest and reflection. In a psychic tarot reading, this cards shoes that you are over stressed; you need a break and distance from daily routine in order to get healing thoughts. There is too much in your plate!